Not only is LinkedIn the place for successful professionals to connect, it is also a powerful search engine designed to drive qualified traffic to your profile or your website. NuSvara, a leader in developing and implementing effective digital marketing solutions, has mastered the art of building high-quality, targeted connections on the #1 business focused network. LinkGen is a revolutionary process platform, configured to automatically identify and generate connection requests to business professionals with the highest probability of being interested in your value proposition. 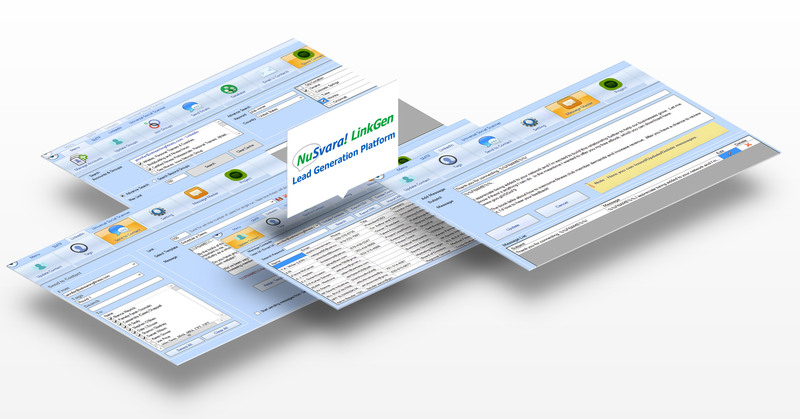 LinkGen will add these Connections to your network and begin a customized automated marketing campaign. Build connections for 30 – 90 days before beginning a sales campaign. These aren’t just any connections that can build up your network numbers – LinkGen will target connections based on the specific demographic you determine is needed for your product or service. Alternatively (or additionally) LinkGen can scrape the contacts of LinkedIn Groups whose members are your target audience. Deliver up to 50 targeted LinkedIn connection requests daily, driving interaction through an auto-responder with a follow up ‘Thank You’ message. An embedded Call to Action will drive a next step interaction. Next steps could include connecting with you on LinkedIn or visiting your website to download a Lead Lure (i.e. an e-book, case study, blog post, webinar, etc.). Because LinkGen will market only to pre-selected contacts, it will drive qualified traffic to your profile or website, allowing you to build a high-quality, targeted set of LinkedIn connections and, ideally, new clients. Once the connections are built and your network has been expanded, LinkGen will send up to 250 LinkedIn messages per day until all of your LinkedIn connections have received a targeted selling message LinkGen can be configures to export your Connections to a .CSV file for use in your email marketing campaigns, including connections from Groups of which you are a member. NOTE: The platform requires a LinkedIn Premium Account. The noticeable increase in your LinkedIn connections and growth of your personal network. 2)	Through Google Analytics-measured results, i.e. the number of times a Lead Lure (i.e. an e-book, case study, blog post, webinar, etc.) on your website has been visited because of the LinkedIn campaign. LinkGen Campaigns will provide an incremental lift in direct connections to the individual LinkedIn profile we are using for your marketing campaign. Not all campaigns are the same, however we guarantee our LinkGen campaign will deliver a minimum of 100 new first (1) tier connections per month for the individual profile. If this is not reached there is no payment due for that months work. All work in the first month is billable and is not subject to the Performance Guarantee. LinkedIn marketing and optimization services for your company. With NuSvara's LinkedIn Profile Optimization, you can boost your personal brand and increase organic search traffic to your profile. Optimize your LinkedIn profile so that it’s actively working as a sales funnel, not just as a static resume of past work and accomplishments. 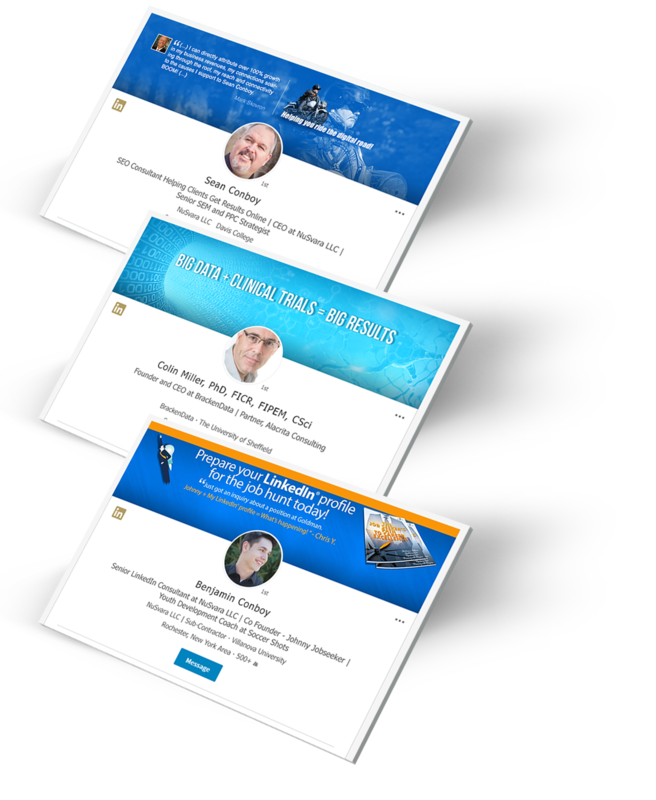 If you are driving traffic to your profile through the NuSvara LinkGen Lead Generation Platform, make sure that your profile is the best that it can be. Presents you as a valuable resource to people looking for your services, the instant they search for those services. Makes use of LinkedIn as a search engine. Attract more connections and drive qualified traffic to your profile through the effective use of keywords. Ensures that you stand out from the crowd, and generates inquiries from the people who are looking for you based on the content and structure of your profile. Provides a steady flow of profile views by improving your visibility on LinkedIn. Provides a custom new graphic banner for your personal page. NuSvara understands that with 500 million users worldwide, LinkedIn is a powerful resource not only for building a network, but for creating targeted lead generation. Our proven platform will boost your personal brand, bring the right connections to you, and effectively present your skills to those looking for your expertise.